Accidents happen when you least expect them -- usually as rare, once-in-a-lifetime occurrences. But you can be prepared. When reading each of the following pet scenarios, ask yourself 'What would I do?' Each of these tragic events could literally send your life into a tailspin if they ever happened to you, or your dog. So... what would you do? Suddenly our dog refused to walk down stairs in our home. They are solid wood, not carpeted. Before this, he went up & down the steps fine. My DIY solution. If you live in Arizona, Florida, or parts of California and you have a dog… listen up! 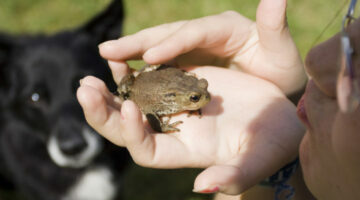 Dog frog poisoning is a reality. Here are the toads to watch for and what to do if your dog comes in contact with a poisonous toad. As part of puppy-proofing your house, make sure you never leave loose change lying around… especially pennies! Pennies have zinc in them and zinc is fatal to dogs. As seen in this video, the secret to a dog’s survival after swallowing one or more pennies is early removal! 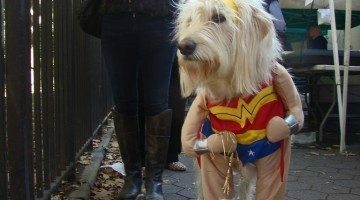 If you’re going to dress your dog for Halloween, here are some things you might not think of when it comes to dog Halloween costumes.